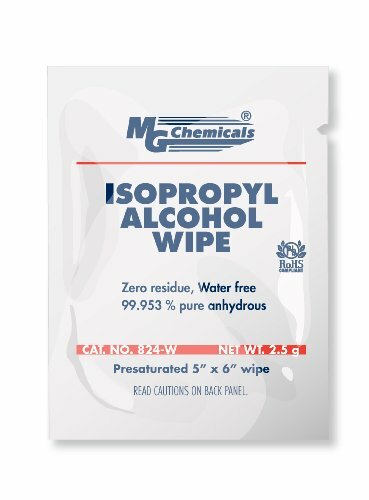 "MG Chemicals Isopropyl Alcohol Wipe is a high purity Cloth type multipurpose cleaning wipe pre-saturated with 99.953 % Isopropyl Alcohol. Measures 6"" length by 5"" width. The wipe is good at dissolving dirt, light organic contaminants, and ionic flux residues. Since the 824-W is highly anhydrous (without water) and hygroscopic (absorbs humidity), it readily scavenges water off surfaces and helps to dehumidify surfaces. Applications & Usages Since the Isopropyl Alcohol Wipe is safe for most plastics, seals, ceramics, and printed circuit board components, it is used heavily in the electronics industry. It is great for cleaning stencils, cables, printed circuit board components, or electrical contacts and connectors. It effectively removes light greases, oils, and flux without adding additional residues to contacts, relays, and circuit boards connectors. It is quick drying relative to water. RoHS Compliant. " FOR INDUSTRIAL USE ONLY. NOT FOR RETAIL SALE IN CALIFORNIA. If you have any questions about this product by MG Chemicals, contact us by completing and submitting the form below. If you are looking for a specif part number, please include it with your message.